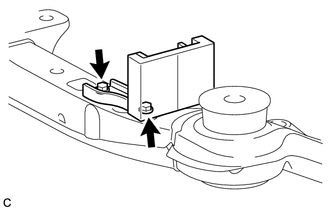 Refer to the procedure up to Remove Engine Assembly with Transaxle (See page ). (a) Remove the 2 bolts and front suspension member dynamic damper. 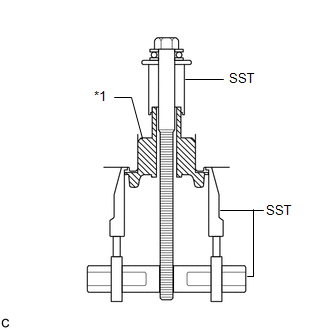 (a) Install SST as shown in the illustration. 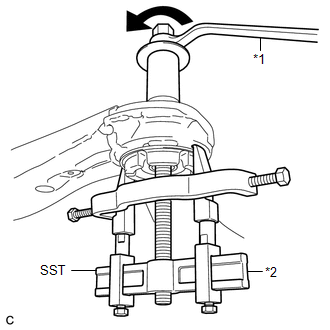 (b) Using SST, remove the front suspension member body mounting front cushion. Make sure that the claws of SST are securely hung onto the mounting front cushion. Be careful as the mounting front cushion may fly out. The mounting front cushion cannot be reused. 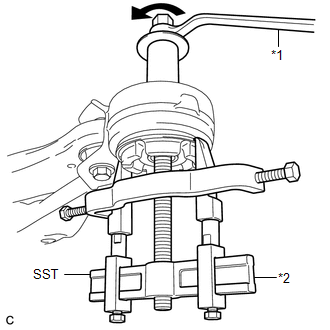 (b) Using SST, remove the front suspension member body mounting rear cushion LH. Make sure that the claws of SST are securely hung onto the mounting rear cushion. Be careful as the mounting rear cushion may fly out. The mounting rear cushion cannot be reused.